The Aquarium of the Pacific has joined with eighteen other aquariums across the United States and created a new Aquarium Conservation Partnership (ACP) to address one of the gravest threats facing ocean and freshwater animals – plastic pollution. Today, the ACP announced the launch of a nationwide consumer campaign and a business commitment to drive a shift away from single-use plastic among their visitors, in their communities, and beyond. “The Aquarium of the Pacific is a trusted source of science-based information on the ocean and environment in our region. It is our aim to provide our visitors with practical things they can do as ocean stewards in their communities. We are proud to be joining with aquariums across the country to promote ocean conservation,” said Jerry Schubel, Aquarium of the Pacific president and CEO. 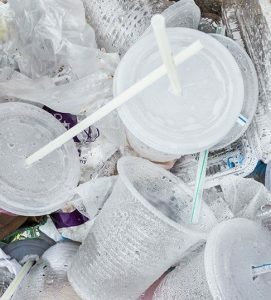 Through the national “In Our Hands” campaign, the ACP hopes to empower their 20 million visitors and millions more in their communities to drive a national shift away from single-use plastic and toward innovative alternatives. The public can learn more about the Aquarium of the Pacific’s commitment and achievements atpacific.to/singleuseplastic. About 8.8 million tons of plastic enter the ocean each year worldwide – roughly a dump truck full of plastic every minute of every day. In the United States alone, plastic waste averages more than 200 pounds per person each year. If nothing changes, by 2025 the flow of plastic into the ocean is expected to double. But it’s not just the ocean that’s affected: Plastic pollution in lakes and rivers has been found in concentrations as high, or higher, than in oceanic gyres that concentrate plastic trash. Today, there are an estimated one billion plastic particles floating on the surface of Lake Michigan, alone. The Great Lakes are the largest surface freshwater system on Earth, making up approximately 21 percent of the world’s supply of surface freshwater. Additionally, more than 3,500 species of plants and animals live in the Great Lakes basin. The aquariums are also using their collective voice – at the local, state and national level – to support policies that reduce the flow of plastic pollutants into the ocean, rivers and lakes. Beyond sponsoring clean-up events and education programs, many have backed successful efforts to stem the use of plastic shopping bags and plastic microbeads found in personal care products. The Aquarium Conservation Partnership (ACP) is a collaboration of 19 AZA-accredited public aquariums across North America committed to advancing conservation and advocacy of the world’s oceans, lakes and rivers through public action, business leadership and policy changes aimed at addressing major threats to aquatic environments.